You may have seen that I recently wrote a post on my long weekend in Croatia with my son, but if not then Part One is right here. Part Two is all about our escapades over in Bosnia and Herzegovina, more particularly our visit to the humble but still clearly war affected town of Mostar. Coby and I had no idea what to expect from Mostar, but what we did see and learn is probably something that we’ll never forget. I got the impression a few people were surprised when I told them we were heading over to Bosnia & Herzegovina. I’d done the research though. The war between Croatia and Bosnia-Herzegovina had been over and finished for two decades, we would be fine, even if there are apparently still risks of stepping on a landmine… joking… (not). With a moody Coby (he didn’t appreciate our 6.15am pick up) we boarded our mini-bus with eight other sleepy tourists and we drove for a couple of hours admiring the beautiful Croatian views. Making our way (precariously) across the Bosnian border shortly after arriving in the slightly grey, but charismatic pretty town of Mostar. It’s quite hard to explain what Mostar is like. It certainly hasn’t been restored the same way Dubrovnik has, and whilst it is listed as a UNESCO World Heritage Site there are still signs and remnants of the 1992–1995 Bosnian War everywhere. It’s quiet, it’s calm but has an edge of nervousness to it still. Coby was silent…that never happens! We couldn’t quite work out what was going on at first, but once we met with our guide we began to understand a little more. Our guide was called Jusef and told us he was a ‘born and bred’ Yugoslavian. He said he wouldn’t impose his opinions on us but more tell us the facts about Mostar. One thing he did say that was prior to the Bosnian war Yugoslavia may have been a communist country but it wasn’t communist the same way Russia was, everyone was happy. Healthcare was free, unemployment was low and the war certainly wasn’t welcome with the people. Since the war ended Mostar now has a 46% unemployment rate, a complicated government structure, no free healthcare and no free primary school education. The town is split in two with a busy main road keeping each district apart, and I even found out that Mostar has two phone networks, two electricity companies, and two school systems! I wouldn’t say we felt in danger in any way, it wasn’t threatening at all, and I think that each group or religion residing in Mostar are clearly very proud of their beliefs and have firm opinions on who the country really belongs to. The impression I have is that Bosnians are very quiet, almost melancholic. Even when the streets are packed with people it can be super quiet. Told you it was hard to explain, the only way you can really understand what it is like is to visit! We wandered through East Mostar, the oldest and prettiest part, with plenty to offer. The cobblestone streets (which apparently were made a certain way to massage your feet the same way reflexology does), are filled with markets and food stalls, all of which kind of made me feel like I was in Turkey or Marrakesh! We eventually made our way over to what we really came to see. The Stari Most Bridge. The bridge is actually a reconstruction of a bridge which previously stood for 427 years before being destroyed in 1993 by the Croatians during the War. The bridge was then rebuilt and opened again to the public in 2004. It is huge… and kind of mesmerising! The water below is a lovely shade of turquoise and it has some of the most amazing views over the town, I’ve never before seen a river of such stunning colours. I think this has to be one of my most favourite photos I’ve taken yet. Whilst here, we had the chance to see a man jump off of the bridge and dive into the flowing river below. I had previously read that they wouldn’t jump for less than €25 so our group all pitched in and paid the guy. This is his job! He jumps off a bridge and risks his life every day to make a living. Up he went again, teasing the crowds and we sat anxiously ready to snap a photo of him leaping from the bridge before doing a perfect dive into the water. After some time, he finally jumped, arms soaring behind him, toes pointed and a big smile on his face! Our guide told us that you’re not a real Bosnian until you have jumped from the bridge and he’d actually done it when he was just 14 years old! His Mum of course went insane when she heard. Made us chuckle. After watching this craziness we meandered through the small walkways enjoying looking at one souvenir shop after another, and stopped for some lunch by the river next to this cute miniature bridge which actually repeats the form of the Stari Most Bridge – cute! Tourists are the livelihood of Mostar who are really trying to get their foothold in this world. If more tourists arrive, the economy will get better and the living conditions of people will improve. While I was never worried about myself or Coby whilst we were in Mostar, there were people, especially women and children begging for money. This, I did not see as a threat or danger to our visit. It only made us feel sorry for them and want to help them. Anyway, we were moving on and we had one more stop before heading back over to Croatia – the Kravice Waterfalls. A large lake surrounded in waterfalls, free to enter and flipping freezing cold! Stretching over 100m across and tumbling down 25m, Kravice is one of the largest waterfalls in Herzegovina and certainly the most impressive. The sound of the water crashing down is incredibly relaxing too. We sat and had a little time-out before heading back up to the mini-bus, driving back to our apartment and crashing out! I’m a little vague on the journey back as Coby and I took over the back seats, closed our eyes and snoozed all the way home! I hope you’ve enjoyed reading my little two-part series. I’d not only highly recommend taking some time out with your child to do something different but I’d also, and I think this is clear, highly recommend visiting both Dubrovnik and Mostar, there are literally no other places like them on Earth and they are both equally as breath-taking. "How to Price a Cake"
Oh wow. We really need to visit Croatia. This has really helped so thanks. I love to travel! Your travels look amazing and I love the pictures. I’m in love with the pictures…great efforts!! also a wonderful and helpful piece! I’ve never been to Mostar, I’ll have to add it to my list! These pictures are stunning, especially the photo of the Kravice Waterfall. It sounds like it was a great trip! Omg noon that’s what I’d be afraid of!! Oh this looks amazing! We love travelling and it’s fun with teens isn’t it! The jumping off the bridge would be my 15 year old…..I’ve always wanted to go to Croatia as it looks great for snorkelling but the history in your post is also clearly visible. What a fun trip. Thank you for posting! #tweensteensbeyond. I think Coby (12 years old) was tempted too – no chance though! ha. This was so fascinating Natalie, I thoroughly enjoyed reading it. I think you describe the atmosphere very well and it’s such a shame that a beautiful country (and its people) was blighted a cruel war. On a lighter note, how on earth does that man survive jumping off the bridge! That terrified me! Thanks so much for sharing with us at #TweensTeensBeyond. Stunning photos and such great experiences. 🙂 I don’t know that Croatia was a place I had planned to go, but now it’s for sure on my list! Wow, what an incredible trip! Your photos are beautiful. 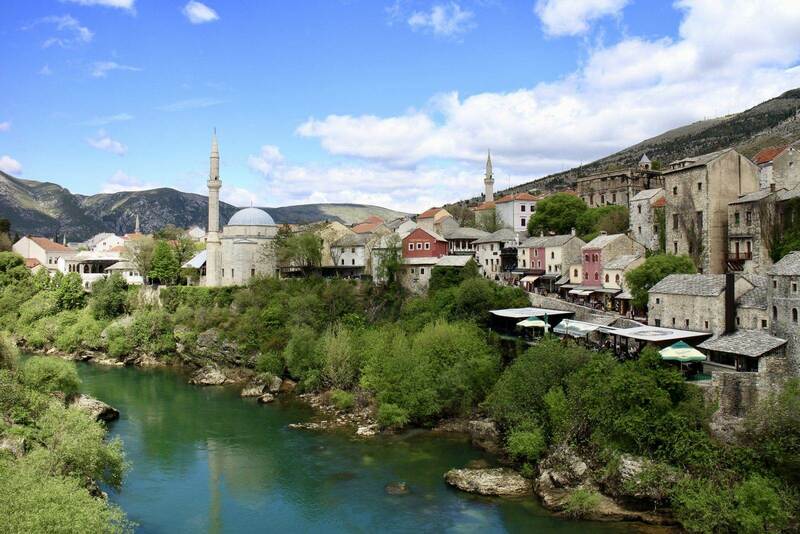 Bosnia is high up on my list of places to visit because my husband worked there many years ago and often talks about how beautiful parts of it are and as you say, it is a safe place to visit these days. Oops, pressed ‘post comment’ too soon. Thanks for linking up to #FamilyTravelTips! Wow! What a brilliant read! This isn’t a place I’d ever have though to visit. But you have me well & truly intrigued! Thanks for opening the world to me a little bit today! What an incredible adventure. Those waterfalls look amazing. I wonder how many times a day that man has to jump into the river. Beautiful Location, We really need to visit Croatia. This has really helped so thanks. Such a beautiful place it is! I am bookmarking it to add it to the list of places to see. Kravice Waterfalls is wonderful and hope it was too powerful too! There is a place called Kutralam in Tamil Nadu, South india which is marked for it’s beautiful, powerful falls and I haven’t still got an opportunity to see such one yet! Hopefully,this would be similar to that! Man jumping off the bridge is still frightening me, especially looking at the rocks down!